1 x 250ml Thinner for clean up. We cannot anticipate all conditions under which this information and our products, or the products of other manufacturers in combination with our products, may be used. We accept no responsibility for results obtained by the applications of this information or the safety and suitability of our products, either alone or in combination with other product combinations for their own purposes. Unless otherwise agreed in writing, we sell the products without warranty, and buyers and users assume all responsibility and liability for loss or damage arising from the handling and use of our products whether used alone or in combination with other products. Ever changing V.O.C. regulations in your area may require you to contact local authorities for proper use and/or disposal of this product. 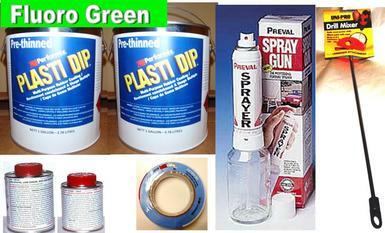 Should you need further assistance, please contact PLASTIC DIPS & COATINGS technical service. sales@plastidip.net.au.